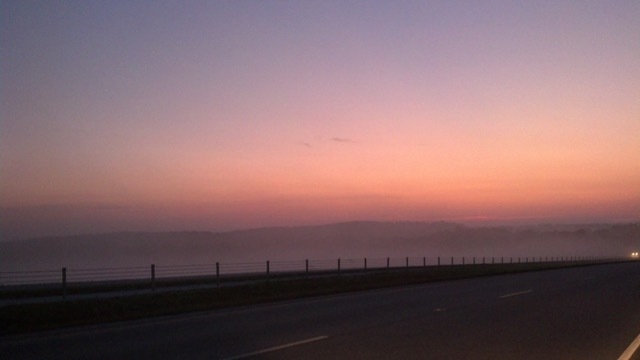 As the darkness closes in on Christians it becomes more apparent we must walk in the light. Be filled with the Holy Spirit! And he said unto them, These are the words which I spake unto you, while I was yet with you, that all things must be fulfilled, which were written in the law of Moses, and in the prophets, and in the psalms, concerning me. Then opened he their understanding, that they might understand the scriptures, And said unto them, Thus it is written, and thus it behooved Christ to suffer, and to rise from the dead the third day: And that repentance and remission of sins should be preached in his name among all nations, beginning at Jerusalem. And ye are witnesses of these things. And, behold, I send the promise of my Father upon you: but tarry ye in the city of Jerusalem, until ye be endued with power from on high. Recognize that the Old Testament is all about Jesus Christ. The grand design of the Triune God is to reveal Christ at exactly the right time in His story. The truth and power of God comes alive in Jesus, the living Word. Who else could “open their minds so that they could understand the Scriptures”? Again, I say to you – be encouraged! When you believe in Christ you are “clothed with power from on high”; that is the Holy Spirit. He works always to convict and transform your heart for Christ and articulates your salvation for His glory. Human or Is It Artificial Intelligence? Should We Be Asking Now? Which restroom do you FEEL like you need to use today? Do you have an online chat with a customer service rep? They really need to connect with us more on a human level so we can take ‘them’ seriously. Right? NOT TO WORRY…nope! They are working on that right now. Please…read this article. Read it twice. Then read it again. Are you ready? Things are getting creepier by the day! Sagar and BabyX in Soul Machines’ Auckland office. 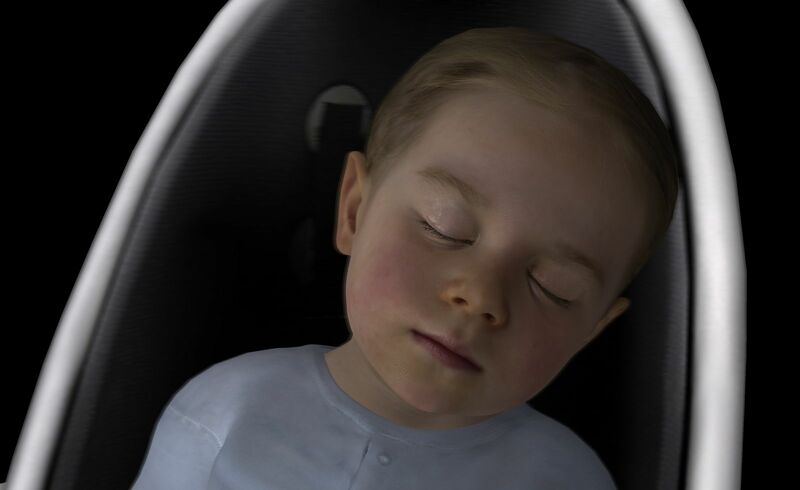 The AI genius, who has built out his virtual BabyX from a laughing, crying head, sees a symbiotic relationship between humans and machines. People get up to weird things in New Zealand. At the University of Auckland, if you want to run hours upon hours of experiments on a baby trapped in a high chair, that’s cool. You can even have a conversation with her surprisingly chatty disembodied head. 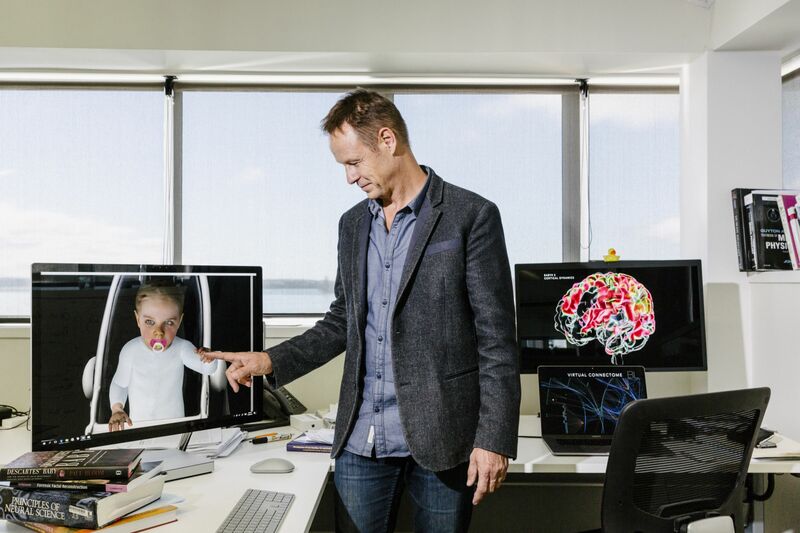 BabyX, the virtual creation of Mark Sagar and his researchers, looks impossibly real. 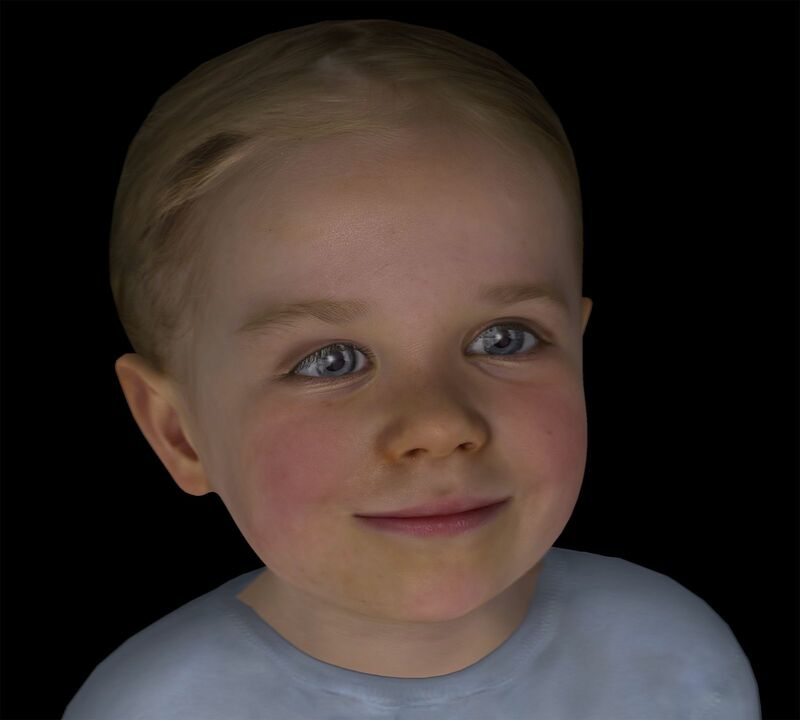 The child, a 3D digital rendering based on images of Sagar’s daughter at 18 months, has rosy cheeks, warm eyes, a full head of blond hair, and a soft, sweet voice. When I visited the computer scientist’s lab last year, BabyX was stuck inside a computer but could still see me sitting in front of the screen with her “father.” To get her attention, we’d call out, “Hi, baby. Look at me, baby,” and wave our hands. When her gaze locked onto our faces, we’d hold up a book filled with words (such as “apple” or “ball”) and pictures (sheep, clocks), then ask BabyX to read the words and identify the objects. When she got an answer right, we praised her, and she smiled with confidence. When she got one wrong, chiding her would turn her teary and sullen. If it sounds odd to encounter a virtual child that can read words from a book, it’s much more disorienting to feel a sense of fatherly pride after she nails a bunch in a row and lights up with what appears to be authentic joy. BabyX and I seemed to be having a moment, learning from each other while trading expressions and subtle cues so familiar to the human experience. That’s the feeling Sagar is after with his research and his new company Soul Machines Ltd. The term “artificial intelligence” has become a catchall for impersonal, mysterious calculations performed behind closed doors. Huge farms of computers crank away at piles of data, using statistics to analyze our internet history, driving habits, and speech to produce targeted ads, better maps, and Apple Inc.’s Siri. This sense of AI as an amorphous shadow falling over more and more of our lives has left people from Stephen Hawking to Elon Musk skeptical of the technology, which tends to feel unnatural, somehow less than real. Sagar is a leading figure in the camp trying to humanize AI, which he says has the potential to yield a more symbiotic relationship between humans and machines. While he wasn’t the first to this idea, his approach is unique, a synthesis of his early years as a computer scientist and later ones in the world of Hollywood special effects. The face, he’s concluded, is the key to barreling through the uncanny valley and making virtual beings feel truly lifelike. Soul Machines’ creations are unparalleled in this respect, able to wince and grin with musculature and features that move shockingly like ours. They have human voices, too, and are already contracted for use as online helpers for companies ranging from insurance providers to airlines. Soul Machines wants to produce the first wave of likable, believable virtual assistants that work as customer service agents and breathe life into hunks of plastic such as Amazon.com’s Echo and Google Inc.’s Home. Companies with similar aspirations throughout Japan and the U.S. have produced a wide array of virtual avatars, assistants, and holograms. Many of the people behind these projects say AI systems and robots can achieve their full potential only if they become more humanlike. They need to have memories, the thinking goes, plus something resembling emotions, to propel them to seek out their own experiences. Sagar’s approach on this front may be his most radical contribution to the field. Behind the exquisite faces he builds are unprecedented biological models and simulations. When BabyX smiles, it’s because her simulated brain has responded to stimuli by releasing a cocktail of virtual dopamine, endorphins, and serotonin into her system. This is part of Sagar’s larger quest, using AI to reverse-engineer how humans work. He wants to get to the roots of emotion, desire, and thought and impart the lessons to computers and robots, making them more like us. Here’s what should really freak you out: He’s getting there a lot quicker than anybody would have thought. Since last year, BabyX has, among other things, sprouted a body and learned to play the piano. They grow up so fast. Sagar made use of those observations as a young man abroad, when he sketched portraits for cash on the street and in restaurants. Like many youngsters from his part of the world, he took an extended break between high school and college. For four years he crisscrossed the globe, drawing, bartending, selling door to door, even filling sandbags for the Australian army to pay his way. After returning to New Zealand, he earned a Ph.D. in engineering from the University of Auckland, then pursued postdoctoral work at MIT. In Massachusetts, he and some colleagues built digital models of the human eye that were detailed and lifelike enough for surgeons to use for practice. 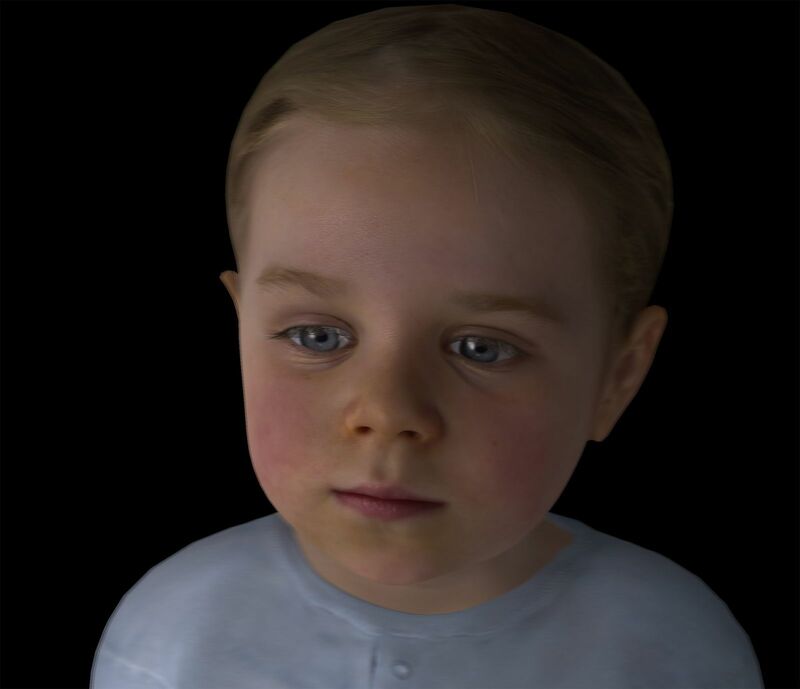 By 1998, Hollywood had called on Sagar to try to make computer-generated imagery, or CGI, look less CG. His first project was a remake of The Incredible Mr. Limpet, which called for Sagar’s team to morph Jim Carrey into a talking fish capable of hunting Nazi U-boats. (Yes, really. The original starred Don Knotts.) Warner Bros. Entertainment Inc. abandoned the project after paying for $10 million in digital Carrey-fish expressions, deeming it too costly for a full-length film. Sagar, however, wasn’t ready to stop working on digital faces. For a couple of years he used the creatures as the basis of a virtual assistant startup called Life F/X and had his faces read emails aloud. The company died with the dot-com bubble, so Sagar took a job doing special effects for Sony Pictures Imageworks Inc. (Spider-Man 2). That made him well-known in the movie business and led him back to New Zealand in 2004. At Weta Digital, the effects shop run by Lord of the Rings director and fellow Kiwi Peter Jackson, Sagar won two Academy Awards in seven years, overseeing the digital character creation for Jackson’s King Kong remake and James Cameron’s Avatar. His synthesis of engineering and artistry had provided him with an advantage in making Kong and the alien Na’vi seem real. Years of drawing portraits and crafting virtual eyeballs had given him insights into the nuances of the face that are uncommon among CGI specialists, while his effects software has made it relatively easy to film an actor going through a range of emotions and to automatically fuse the expressions into, say, a giant gorilla. “It’s these almost imperceptible movements in the eye and face that we pick up on as something having a soul behind it,” he says. Feeling he’d solved the riddles of the face, Sagar dreamed bigger. He’d kept an eye on advancements in AI technology and saw an opportunity to marry it with his art. In 2011 he left the film business and returned to academia to see if he could go beyond replicating emotions and expressions. He wanted to get to the heart of what caused them. He wanted to start modeling humans from the inside out. At the University of Auckland, Sagar created the Laboratory for Animate Technologies and recruited about a dozen researchers. Far from Weta—or his Life F/X office on Hollywood Boulevard, with Bob Marley’s star out front—the Animate team worked in a cramped room kept permanently hot and sticky by the heat from their powerful computers. When I saw the space last year, the engineers were surrounded by giant animated faces projected onto the walls, every pore and eyebrow hair distinctly rendered. Far from being lifeless, the faces appeared eager to strike up conversations, their muscles contracting and relaxing with each breath. At the back corner of the lab, Sagar sat amid a clutter of notes and books such as The Archaeology of Mind and Principles of Computational Modelling in Neuroscience. It was there, on his pair of massive computer monitors, that he put BabyX through her virtual paces. 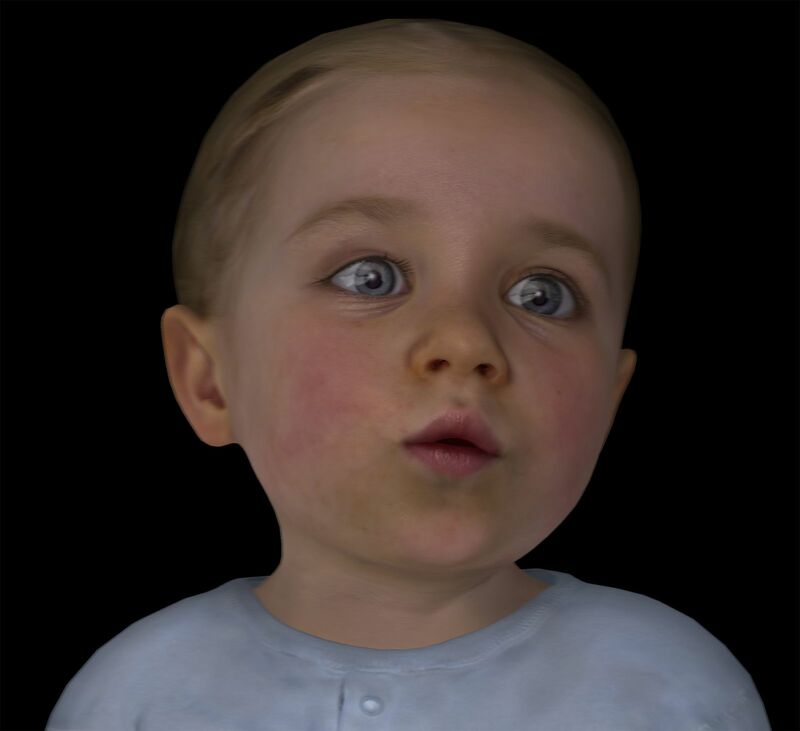 The baby represented the culmination of much of the lab’s efforts, combining Sagar’s facial artistry with the latest in AI learning and speech software. Underneath that cherubic face, there was also some pioneering, and borderline horrifying, technology. Sagar clicked again, and the tissue of the brain and eyes vanished to reveal an intricate picture of the neurons and synapses within BabyX’s brain—a supercomplex highway of fine lines and nodules that glowed with varying degrees of intensity as BabyX did her thing. This layer of engineering owes its existence to the years Sagar’s team spent studying and synthesizing the latest research into how the brain works. The basal ganglia connect to the amygdala, which connects to the thalamus, and so on, with their respective functions (tactile processing, reward processing, memory formation) likewise laid out. In other words, the Auckland team has built what may be the most detailed map of the human brain in existence and has used it to run a remarkable set of simulations. Not long after my first play date with BabyX, Sagar packed up his lab and researchers and moved them to the top floor of Auckland’s iconic Ferry Building, where he started Soul Machines to commercialize his team’s breakthroughs. By his standards, the near-term commercial applications are pretty straightforward. About 45 staffers, including artists, AI experts, language experts, and coders, are building a cast of virtual assistants. For the most part, these are refined versions of Sagar’s Hollywood work, only they’re smart enough to understand spoken language and respond to queries, with less of the creep factor characteristic of virtual people. The first face Soul Machines revealed to the world, in February, is Nadia, a pretty white woman with pulled-back brown hair, greenish eyes, pink lipstick, and Cate Blanchett’s voice. Sagar’s team developed her for Australia’s National Disability Insurance Agency, which plans to employ her as an online aid for the country’s 500,000 people with disabilities. The hope is that those interacting with Nadia on the agency’s website will find her more personable and usable than text-based chatbots or the menu trees on its automated phone line. Sagar had some help with Nadia, using International Business Machines Corp.’s Watson technology as the basis for her speech recognition. His company recruited Blanchett to spend 15 hours recording phrases that the software can turn into a much wider variety of responses to questions. Nadia has already been tested on 10,000 people, who taught her to refine her answers and the emotions she displays at certain times. The Australian government expects her to start full-time work early next year. Soul Machines has 10 trials under way with airlines, health-care providers, and financial-services firms. In the early going, the company’s biggest test will be whether users find its software realistic enough to be as satisfying as human conversation. Even successful customer-relations experiences with chatbots, ones where the bot gives the right answer, tend to leave people dissatisfied because they feel like they’ve been pawned off on an inferior being. To make its process easier to repeat, Soul Machines is writing character creation software that reduces development to a series of simple menus. By sliding a few dials, Sagar can transform a young, thin avatar into an older, chubbier one and alter complexion and other features. Each menu-built result looks as lifelike as a character that a film production or video game developer might spend millions of dollars and many months to create. The company has paid actors to record hundreds of hours of monologue, assembling an audio library it can use to give voice to characters such as a troll meant for a client in Scandinavia or an animated, anthropomorphic strawberry that’ll be used on an educational site for children. Like Cross, Sagar often appears oblivious that his pitch might sound creepy. In August, when I pay a visit to Soul Machines to see Sagar’s latest creations, he’s wearing a T-shirt that depicts two fetuses sharing a womb, arranged head-to-toe in a kind of yin-yang pose. One of the fetuses is human; the other has a distinctly artificial brain filled with circuitry. He wanted to make this design the company logo. The investors who gave him $7.5 million last November said no. Sagar comes off like a visionary academic, at times almost possessed. Ask a basic question, and you’re likely to get an impassioned 30-minute response that weaves in AI, art, psychology, and Plato. It’s hard to imagine this man holding court with a car insurer, trying to sell a suit-wearing executive on a virtual avatar, without things getting weird. But Sagar says he relishes the commercial part of the business, because it’s helping him better understand what people like and don’t like about his avatars and zero in on the finer details of interpersonal interactions. Version 5.0 of BabyX has gone far beyond the original floating head. BabyX now has a full body that sits in a high chair, legs bobbing back and forth while her hands look for something to do. For the next part, you’ll want to sit down and grab a pacifier, too. Sagar’s software allows him to place a virtual pane of glass in front of BabyX. Onto this glass, he can project anything, including an internet browser. This means Sagar can present a piano keyboard from a site such as Virtual Piano or a drawing pad from Sketch.IO in front of BabyX to see what happens. It turns out she does what any other child would: She tries to smack her hands against the keyboard or scratch out a shabby drawing. Does the baby get bored of the piano like your non-Mozart baby? Yes, indeed. As she bangs away at the keys, the amount of dopamine being simulated within the brain receptors decreases, and BabyX starts to ignore the keyboard. In about 18 months, Henderson plans to use an upgraded version of BabyX to run experiments with caregivers and other children. 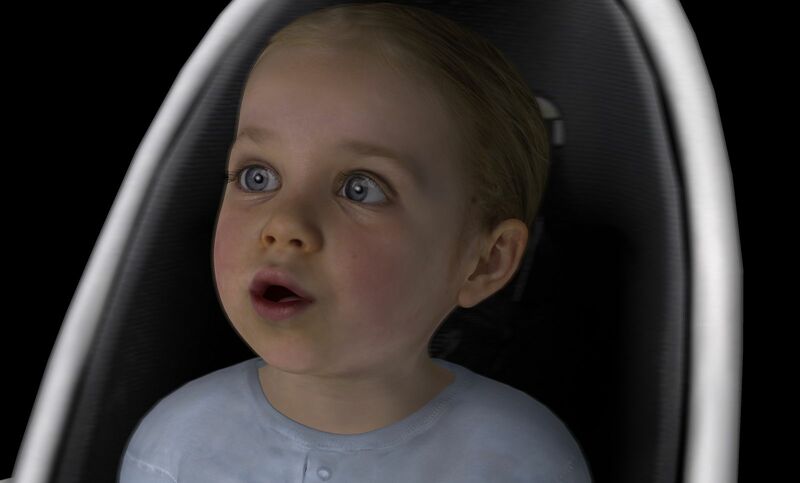 She sees the virtual baby as a way to test new theories in previously unimaginable ways, by altering thousands of variables at will—what if a baby doesn’t smile, what if she won’t hold your gaze, and so on. 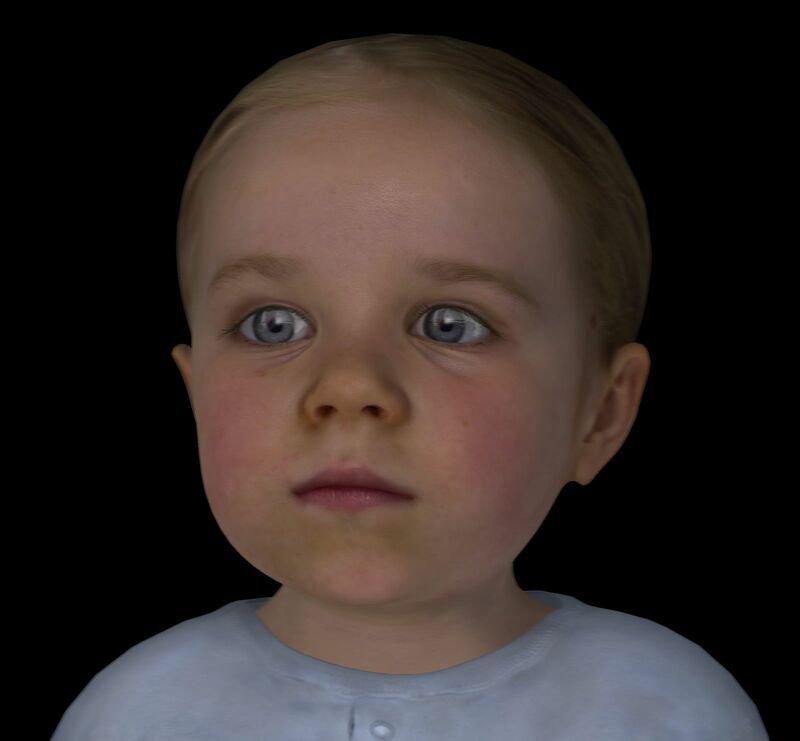 Studying a virtual child’s response to stimuli, she says, may help researchers understand how to better engage with flesh-and-blood children who aren’t particularly social. Other researchers caution that Sagar could be misleading people about the state of the technology through his cute, intricate faces. “Westerners tend to want to anthropomorphize these things, and we can get very enchanted by them,” says Ken Goldberg, a professor of industrial engineering and operations research at University of California at Berkeley. “If you make it look human and act human, you almost have a double responsibility to be clear about its limitations.” He applauds Sagar for doing this type of research but doesn’t want people to get false hope about the near-term benefits of such technology. Sagar has a tendency to talk as though BabyX can already do all the things he’s dreaming. While it seems reasonable to assume Sagar’s endgame is a world that ties humans inextricably with machines, he often spends weekends in the wilderness to get away from computers, and he won’t let his kids use the internet at night. This isn’t exactly the type of behavior one might expect from someone pushing AI as fast as he can into the unknown and hoping for the best. During one of our conversations, I point out that tales such as Frankenstein don’t usually end up well for the humans. “We’re not digging up dead bodies,” he says, neatly dodging the real moral of the playing-God story. You don’t have to be paranoid to believe the rise of AI could turn out quite badly for humans. The computers might start making decisions for themselves, and those decisions could include things detrimental to mankind. One minute, BabyX is eating a virtual pudding cup off a website; the next, she’s sold your house for personal amusement or decided she should be in charge. Sagar remains sanguine about the lessons AI can learn from us and vice versa. “We’re searching for the basis of things like cooperation, which is the most powerful force in human nature,” he says. As he sees it, an intelligent robot that he’s taught cooperation will be easier for humans to work with and relate to and less likely to enslave us or harvest our bodies for energy. “If we are really going to take advantage of AI, we’re going to need to learn to cooperate with the machines,” he says. “The future is a movie. We can make it dystopian or utopian.” Let’s all pray for a heartwarming comedy. Can We Glorify God? If So Then How? First we must look at a couple of things about ourselves and about this world around us. We need to take a honest look within ourselves to see if something is there that hinders our hearts from being poured out before our Lord God in prayer. Not JUST prayer, but fervent prayer. ​It is happening. I MUST BEGIN TO PRAY LIKE I DID IN THE PAST. I must pray like that for my husband, for my sons, for my husband’s grown children, and for our 5 grandchildren. I might not be able to do anything else for them but WHY AM I NOT FERVENTLY PRAYING FOR THEM AS I DID WHEN I HURT SO MUCH? Has my love for the lost in my family began to grow cold? Perhaps it has. I have began to feel so alone in my faith that it feels like the world around me is only unbelief. I must begin praying in a bigger way! I must pour out my heart before the Lord again in a way and a level that I haven’t in awhile. I love this verse. Our Father desires His children to call out to Him when we are in trouble or distressed. He desires to help His children. He wants the best for us. He will deliver us AND THEN. …it will GLORIFY HIM! How awesome is that? How often do we think about us crying out to our Father in Heaven doing anything other than helping us in our distress? We try doing it on our own which isn’t what God tells His people. We are also missing opportunity to glorify the Father. We are supposed to glorify Him in all we do and yet we often miss a basic daily opportunity to do just that. If anyone is still reading this then I pray with FERVENCY that God will bless you and keep you and one day I look forward to meeting all my brothers and sisters in Christ Jesus! How many of us in 2017 really know what the meaning of the word fervent means? So often we think we know what something means but do we really ‘get’ the underlying truth to a word? Look up words, even those you claim to understand. May I also suggest that you purchase an 1828 American Dictionary of the English Language by Noah Webster. This has been one of my best investments other than that of the King James Bible. Any other dictionary along with new versions sometimes change the meaning of words with the times. I personally desire to know what the word originally meant. What did it mean when it was translated into our language? Powerful! This gave me a renewed passion to pray for those I love so dearly that are lost. God works in amazing ways! Beautiful testimony. ..moving from darkness to the light. The true light. Not a light that can be blown out but a light that will shine brightly wherever it goes! Jesus Christ still lives! He is still coming to all to seek Him, to all who cry out to Him, to any who hear Him knocking on their hearts ! He loves you and wants to come in. You have to ask Him, you have to open the door and don’t give up, keep seeking the only One who has the power to save! God bless you all. God is not finished yet! Next we read ‘Let the REDEEMED of the Lord say so’. Now ask yourself this question. Who do you say the redeemed are? Why do you believe what you have just written down about who the redeemed are? Lastly, are you one of the redeemed? Joh 17:2　As thou hast given him power over all flesh, that he should give eternal life to as many as thou hast given him. Joh 17:3　And this is life eternal, that they might know thee the only true God, and Jesus Christ, whom thou hast sent. Joh 17:4　I have glorified thee on the earth: I have finished the work which thou gavest me to do. Joh 17:5　And now, O Father, glorify thou me with thine own self with the glory which I had with thee before the world was. Joh 17:6　I have manifested thy name unto the men which thou gavest me out of the world: thine they were, and thou gavest them me; and they have kept thy word. Joh 17:7　Now they have known that all things whatsoever thou hast given me are of thee. Joh 17:8　For I have given unto them the words which thou gavest me; and they have received them, and have known surely that I came out from thee, and they have believed that thou didst send me. Joh 17:9　I pray for them: I pray not for the world, but for them which thou hast given me; for they are thine. Joh 17:10　And all mine are thine, and thine are mine; and I am glorified in them. Joh 17:11　And now I am no more in the world, but these are in the world, and I come to thee. Holy Father, keep through thine own name those whom thou hast given me, that they may be one, as we are. Joh 17:12　While I was with them in the world, I kept them in thy name: those that thou gavest me I have kept, and none of them is lost, but the son of perdition; that the scripture might be fulfilled. Joh 17:13　And now come I to thee; and these things I speak in the world, that they might have my joy fulfilled in themselves. Joh 17:14　I have given them thy word; and the world hath hated them, because they are not of the world, even as I am not of the world. Joh 17:15　I pray not that thou shouldest take them out of the world, but that thou shouldest keep them from the evil. Joh 17:16　They are not of the world, even as I am not of the world. Joh 17:17　Sanctify them through thy truth: thy word is truth. Joh 17:18　As thou hast sent me into the world, even so have I also sent them into the world. Joh 17:19　And for their sakes I sanctify myself, that they also might be sanctified through the truth. Joh 17:21　That they all may be one; as thou, Father, art in me, and I in thee, that they also may be one in us: that the world may believe that thou hast sent me. Joh 17:23　I in them, and thou in me, that they may be made perfect in one; and that the world may know that thou hast sent me, and hast loved them, as thou hast loved me. Joh 17:24　Father, I will that they also, whom thou hast given me, be with me where I am; that they may behold my glory, which thou hast given me: for thou lovedst me before the foundation of the world. Joh 17:25　O righteous Father, the world hath not known thee: but I have known thee, and these have known that thou hast sent me. Joh 17:26　And I have declared unto them thy name, and will declare it: that the love wherewith thou hast loved me may be in them, and I in them. Which thou hast sworn unto our fathers from the days of old. Why? Oh Lord God, Why? I so want to go home. First I have watched this world go into the unimaginable places I honestly never gave thought to. I never dreamed of seeing such things happen here in America or the things around the world to our brothers and sisters in Christ Jesus. As I have watched and went from a range of emotions from shock, to anger to frustration. I would hope that things would begin to get better and would see things only grow worse. I have to only look to the Lord God, our Father in Heaven. I am glad Trump won. It feels good to at least see many brothers and sisters from all over the world praying for our new worldly leader and the values he says he has. Now we need to put that focus back where it belongs, on our Creator and Sustainer, the love if our lives. Dear Lord God show me what You would have me do for You. Thank You that You have allowed me to see such evil so that I might see clearly that I have nothing here. I do not want to hold on to a thing here. My soul thirsts for You. How amiable are thy tabernacles, O Lord of hosts! My soul longeth, yea, even fainteth for the courts of the Lord: my heart and my flesh crieth out for the living God. Lord God, please create in me a heart that longs for You always. Help us to seek You every day in the details and circumstances of our everyday lives! Reveal Yourself God, and draw us close to You. Bring about repentance and restoration; heal our hearts and minds from the damage that constantly barrages us. May we always remember Your unfailing love and return to You: the only One worthy to be our first love.